For 59-year-old Franklin County, Tenn., native John Dotson, finishing his college degree seemed far-fetched. But when Dotson’s daughter, Rachel Neal, completed her degree through Trevecca’s Bachelor of Arts in Management and Human Relations (MHR) program, John started to wonder if the program would work for him, too. It was 2009 when Rachel enrolled in the program, attending Trevecca classes one night a week at Motlow State Community College. It would take six more years before Dotson stopped dreaming about completing his degree and made it a reality. Out of high school, Dotson attended the University of Tennessee at Knoxville, where he played baseball on scholarship. But Dotson says he soon lost interest in his education and moved back home. He briefly attended Motlow State Community College, then transferred to Alabama A&M, where he continued to play baseball. Dotson got married while at Alabama A&M and chose to put his education on pause to start working to support his family. “I kept telling myself I would finish my degree later,” Dotson said. “But later never really came.” At the time, Dotson said he figured he was lucky enough to have a good job. He always assumed he really didn’t have time to go back to school, anyway. Then 2009 rolled around, and Rachel enrolled in Trevecca’s MHR program at Motlow State. As his daughter completed her coursework, Dotson became very impressed with the program and its structure. Rachel says that her dad always valued education and encouraged her to pursue her degree. 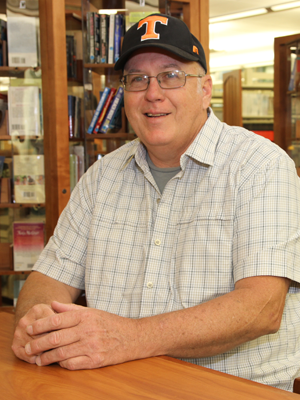 While Dotson knew Trevecca’s MHR program had worked for his daughter, he still wasn’t quite ready to enroll and finish the degree he’d started 40 years before. It would take a few more pieces falling into place for that to happen. Fast forward roughly 40 years of hard work and raising a family. That’s when Dotson’s workplace was bought out by a different company. “My dad began working for an employer who offered tuition reimbursement incentives for the program,” Neal says. Dotson had watched his daughter’s progress and applauded her success in the MHR program. After all those years with an unfinished degree hanging over his head, he began to think that now was the time. After all, when Dotson thought about his “bucket list,” finishing his degree was one of the top items. “I’ve kind of had it on my mind for awhile now, and I kept thinking it’s either now or never,” Dotson says. While Dotson is excited about achieving his decades-long goal of completing his degree, it isn’t the only benefit he’s encountered from the experience. Dotson says his MHR journey has also been a beautiful example of community. Dotson doesn’t deny that he’s had a few challenging moments in the program along the way. Even so, he’s quick to say it’s been a great experience. While Dotson counts Matt Hastings and Dr. Marvin Bunde as teachers who inspired him during his coursework, both are quick to point out that Dotson taught each of them a lesson about perseverance and determination. Bunde, who taught Dotson in one course, remembers his student as someone who spoke with wisdom and offered enlightening comments during class. “I would gladly welcome many more students who reflected John’s interest, commitment to learning, and openness to exploring ideas,” Bunde said. 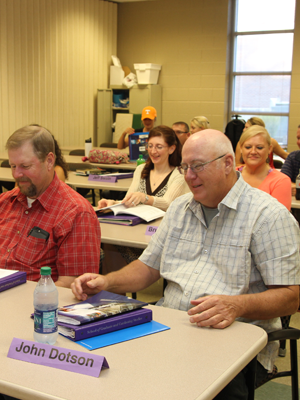 Dr. Tim Eades, associate provost and vice president of Trevecca’s School of Graduate and Continuing Studies, said he was honored to teach Dotson through Trevecca’s program at Motlow State. “One of the reasons I truly love our bachelor’s degree-completion program in management (MHR) is the opportunity it gives us to meet great adult students like John and serve them in obtaining a lifelong goal of a college degree,” Eades said. “For 30 years, Trevecca has been living out its mission to provide education for leadership and service for students of all ages. These days, Dotson is counting down the credit hours needed to get his diploma. He’s set to graduate in November, and one of the first things he plans to do after getting his degree is to start sending out his new-and-improved resume. After working in manual labor for most of his adult life, Dotson’s goal with his new degree is to get a job in management or as a supervisor. According to Bunde, that goal wouldn’t be possible without Dotson’s determination—and the fact that Trevecca offered classes at a satellite location near Dotson’s home. Dotson says he’s excited about completing his degree—and he’s not the only one. His daughter, Rachel, who now works for Trevecca as a campus enrollment counselor at Motlow State, can’t wait to see her dad achieve his dream. After seeing the success of his dad and sister, Daniel Dotson has also enrolled in the program. This fall, he’ll begin the journey of completing his college degree through Trevecca’s MHR program at Motlow State.